June 24, 2011, filed under Country-Wide, White Flag Revolution; No Comments. Action or in-action, make a stand for peace! Not including: on-duty emergency and essential workers, whose work we support. We will never have freedom or peace of mind while people are being oppressed. November 22, 2010, filed under On Strike for Peace, VIDEOS, White Flag Revolution; No Comments. The White Flag Revolution will be hosting a mass rally starting at 10am on the 1st of December 2010. Lets fill Whitehall to bursting point to make our Government listen to the concerns of the British people. Lets hold them to account. 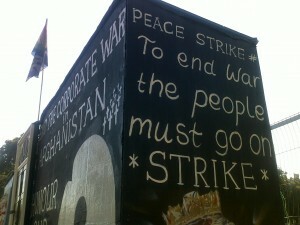 We demand an end to the Afghanistan war!, and the return of our troops to the UK. We want to prevent an expansion to any war in Iran. This war which is unwinnable must end now! Only the people can make this happen, if you want peace then its upto you to come. November 8, 2010, filed under White Flag Revolution; No Comments. A non-violent direct action to shut down Cities and Towns across the United Kingdom starting on Saturday 20th November. Following the STOP THE WAR demonstration at Hyde Park London, the protest will rally at Trafalgar Square, Peacestrike will then proceed down Whitehall / Westminster carrying white flags for peace in order to make a historical stand from 4.30pm. We must unite at this critical time country- wide, to make this the largest civil disobedience action ever. This will be a peaceful protest.Bring white flags,tents, sleeping bags, roll mats, warm clothes, waterproofs,umbrellas, space blankets, anything to keep you warm and dry. Also bring banners and placards. October 22, 2010, filed under Country-Wide, VIDEOS, vigil for Iran, White Flag Revolution; 4 Comments. A non-violent direct action to shut down Westminster and Whitehall including other Cities and Towns across the United Kingdom starting on Saturday 20th November. Following the STOP THE WAR demonstration from Hyde Park to Trafalgar Square proceed with us down Whitehall / Westminster carrying white flags for peace in order to make a historical stand from 4.30pm. This will be a peaceful protest. Bring tents, sleeping bags and refreshments, white flags, make banners, placards. Be prepared to stay as long as needed. Help leafleting and campaign with us to mobilise the widest possible support. Online media can also reach millions. Use Facebook, Twitter, your email, website, blog etc. Following the demonstration we need a 60,000+ critical mass of Volunteers to then proceed to Westminster and Whitehall to send a determined message to our Government that the war in Afghanistan must end! Please join this crucial demonstration in Westminster and Whitehall which will give back a voice to the anti­war majority in this country and tell the politicians the time for peace is… NOW! ⚫ 77% of the general public do not support the illegal war and occupation of Afghanistan. ⚫ 342 service personnel have been killed – twice the number killed in the Iraq war to date, with over 4,000 seriously wounded field hospital admissions,. ⚫Tens of thousands of unarmed innocent Afghan civilians have been killed since 2001, with 2010 the worst year yet. The Orange Revolution ­ staged by the people of the Ukraine, followed the 2004 Presidential elections, for which, it was claimed showed massive corruption, fraud and voter intimidation. This democratic revolution was highlighted by a series of acts of civil disobedience, mass sit­ins and general strikes, with thousands of supporters camping out along the central streets of Kiev. We need UK forces to withdrawn soon; we need to break the NATO coalition. If we don’t act now, this could result in an escalation of war into Iran. So much bravery, loyalty, devotion; so many young lives already destroyed. Unmanned drone planes continue to bomb Pakistan daily, despite the fact that NO declaration of war has been made. This is not reported within mainstream media. The war in Afghanistan is a mess. The insurgency grows, and why wouldn’t it: foreign troops have invaded and occupied their country! The people responsible for 9/11 are no longer there. So why are we? Why are we offering up the lives of our sons and daughters every single day, for no reason anyone can define. The October 20th Governments budgets cuts are upon us. These are the severest spending cuts since the 1930s – all in order to fund an illegal war. the poor to save £1.8bn a year. Peace Strike is committed to bring our service personnel back from Afghanistan alive, and to aid in the prevention of further conflicts within the middle east especially Iran.